Mariners on the Gulf Intracoastal Waterway east of Houston last week might have caught a glimpse of a towboat that’s not only new to the waterway but also marks a first for the shipyard that built it. 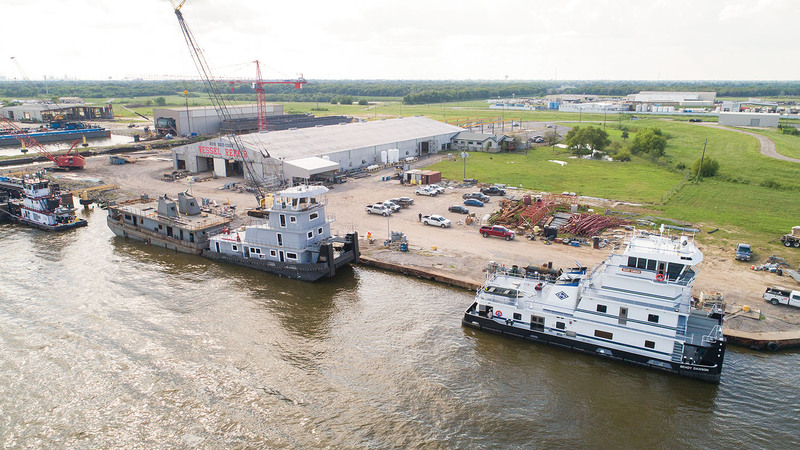 Vessel Repair, the Port Arthur, Texas-based shipyard located on the Sabine-Neches Ship Channel, delivered the mv. Brady Dawson to Kirby Inland Marine last month. The mv. Brady Dawson is the first boat Vessel Repair has built from its own original design. It’s also the first of four boats Vessel Repair will deliver for Kirby over the coming months. Besides including their own original, innovative features, Ron Moerbe, president of Vessel Repair, said he and Kurt also pored over vessel blueprints, picking out the best features and incorporating them into their design. One particularly distinctive feature of the mv. Brady Dawson, and other forthcoming “Pacesetter Class” vessels, is its hull, which is single-chined forward and double-chined aft. Kurt Moerbe said he and his father heard from operators who preferred the maneuverability during flanking of a single-chined (or flat-bottom) hull, while others liked the efficiency associated with double-chined hulls. With a design in hand, the father-son team reached out to Sterling Naval Architects to put the drawings into CAD. They then partnered with Massachusetts Maritime Research (MMR) to test the design against the other hull designs on the inland waterways. MMR conducted multiple studies, including a computational fluid design study and a trim analysis. Vessel Repair has been building towboats for close to three years. The shipyard had long been building barges, along with its repair business, but it pivoted in late 2015 in response to industry trends. “We saw that the tank barge industry was being overbuilt and that there was going to be a slowdown in construction, so we diversified our new construction abilities,” Kurt Moerbe said. Vessel Repair’s first vessel construction contracts were with Golding Barge Line and Kirby, with Vessel Repair taking over hulls begun at other shipyards and carrying those projects to completion. “We used those opportunities to work ourselves into a good relationship with both companies, and it’s produced more work since then,” Kurt Moerbe said. Besides the three additional boats for Kirby, Vessel Repair has a contract to build two new towboats for Golding Barge Line. Another innovative feature of the mv. Brady Dawson is the air flow through the engineroom. Air intake is ducted through the aft engineroom bulkhead at the floor level, then discharged through the stacks. That design, rather than just blowing cool air down from above, produces a more complete air exchange throughout the engineroom, Kurt Moerbe said. All piping systems two inches and smaller throughout the Brady Dawson are stainless steel. Handrails throughout the vessel are stainless steel as well, along with exterior doors. And although the mv. Brady Dawson has bunk beds in some of the staterooms, the Pacesetter Class is designed to allow companies the ability to eliminate bunks altogether. That feature not only eliminates the chore of climbing in and out of a bunk, but aesthetically it also makes the room feel larger, Kurt Moerbe added. Construction of the mv. Brady Dawson was conducted in close coordination with the U.S. Coast Guard and the American Bureau of Shipping (ABS), which acted as the third-party organization under Subchapter M.
According to Vessel Repair, the mv. Brady Dawson is both the first new-construction project for Kirby under Subchapter M and the first vessel ABS has overseen from engineering and design and keel lay through construction under Sub M.
Kurt Moerbe added that, with Vessel Repair’s innovative design and its skilled workforce, the company is eager to continue building on the success of the Brady Dawson for years to come. The mv. Brady Dawson measures 88 feet by 32 feet, with a depth of 10.8 feet. The pilothouse eye level is 35 feet, 6 inches. The vessel has a tankage capacity of 31,000 gallons of fuel, 1,400 gallons of waste oil, 1,400 gallons of gear oil, 3,175 gallons of potable water and 7,500 gallons of fresh water. The Brady Dawson also has full-length dry voids for added protection and stability. RC Schmitt Machine Shop supplied the 8-inch propeller shafts, which are fiberglass-coated with stainless liners. 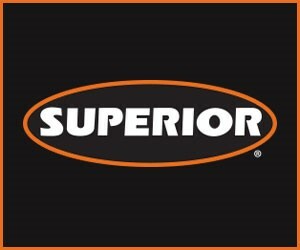 Seals are by Duramax. The vessel also features Thorplas rudder bearings and flanged Johnson Duramax cutlass bearing. Texas Wheel Works supplied the two 85-inch, five-blade Dominator Sound propellers. Main engines are CAT 3512s from Mustang CAT, which produce 2,680 hp. The Twin Disc MGX5600 reduction gears with internal shaft brakes from Sewart Supply have a ratio of 6.04:1. MSI Diesel supplied the 99 kw. John Deere generator set. Eastpark Radiator outfitted the Brady Dawson with its Duraweld grid cooler. The vessel’s engine alarms are by Rio Marine and its steering system is from Rio Controls & Hydraulics. On deck, the mv. Brady Dawson features 40-ton hydraulic Nabrico winches and a Nabrico capstan. Fendering is by Schyuler, with Duramax pads on the bulkheads. Hiller Offshore provided the fire monitoring system. IGM Inland Gulf Marine supplied the electronics and communications equipment on board the Brady Dawson. The vessel features five staterooms, with room for three full beds and five twin beds. The captain’s stateroom, in particular, is expansive. The Brady Dawson also features three full bathrooms and one half bath. Besides the well-equipped galley, the Brady Dawson offers a large lounge/weight room and a separate computer/training room. The mv. Brady Dawson is named in memory of Robert Brady Dawson of Oak Grove, La. Dawson, a Kirby mariner, died January 6 of this year from injuries sustained while working on the Ohio River near Paducah, Ky.